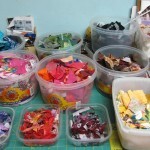 What do you do with all those leftover fabric snippets, my quilting friends??? 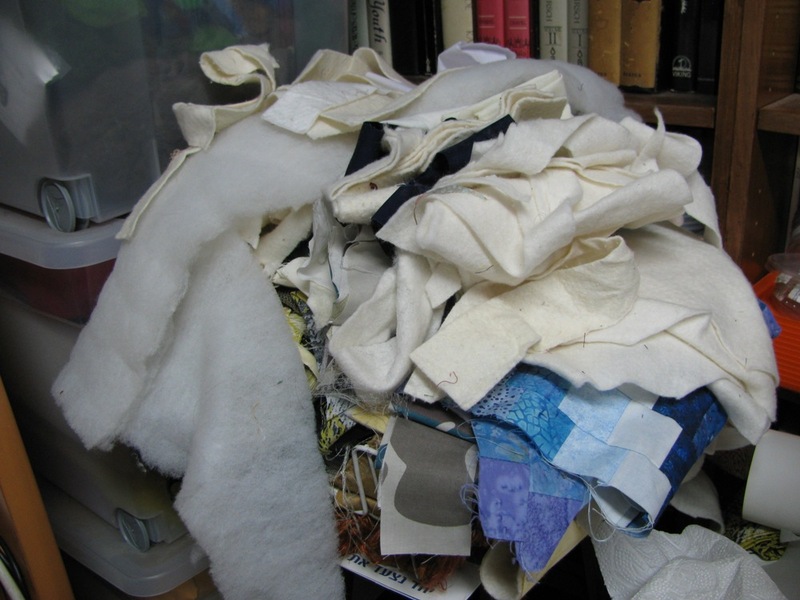 Today a student of mine gently commented that when she works at my sewing station, “things fall on the floor”. 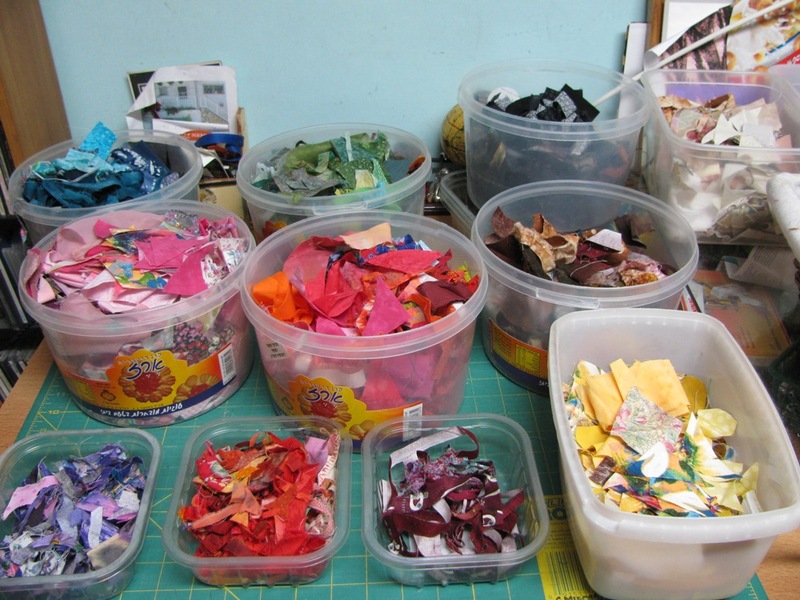 I looked at the workspace and was embarrassed to agree that it was cluttered beyond reason with tiny pieces of fabric snippets and small scraps from my most recent projects. 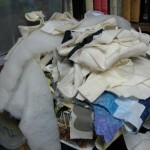 They tell us to keep them so we can use them in tomorrows projects… But what do we do with them once they become cluttered piles? 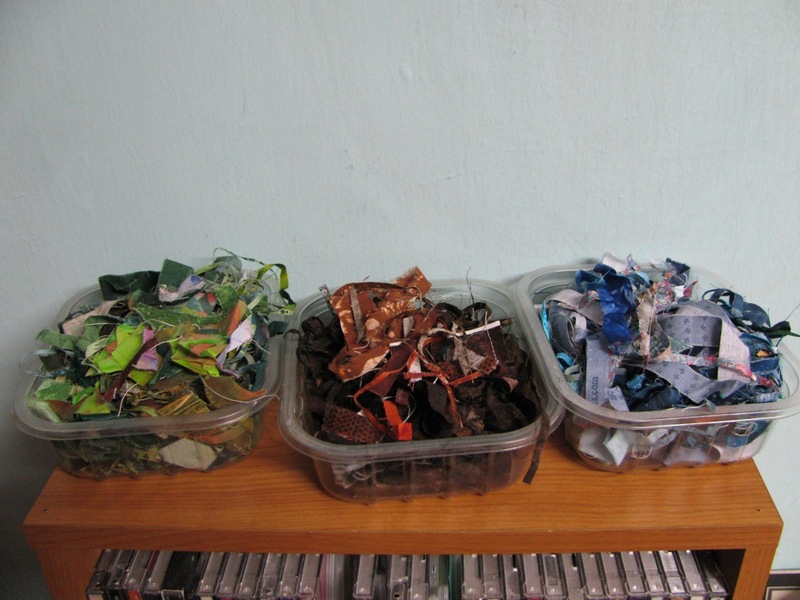 What do you do with batting scraps? Space is not infinite and too many piles are overwhelming. 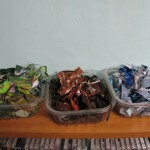 I started the tedious job of sorting them by color. Small snippets went into small plastic containers from my husband’s cold cuts… Large pieces went into the old cookies containers we bought and saved. I sorted till I thought I would scream. I actually took a water break long enough to describe this story here, during which time, one of our many cats came in and dumped two of the containers. OH DEAR!!! So, no choice. I will finish sorting these and cover all the containers. I have shelves for storage and they will serve me well. It has been fun to see what I have. Actually, it’s been inspiring. I started thinking about how some of the green scraps would make lovely tree foliage. So, it is not all for naught. When I am through, I will have a tidy workspace, happier students and a nicer space in which I can create. Here are a few photos of before and after… just to inspire you too.